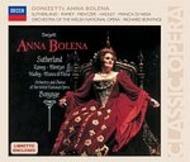 This CD is one of six 'Classic Operas' celebrating the 80th Birthday of Decca's greatest soprano - Dame Joan Sutherland. The story of England's King Henry VIII, the demise of his second wife Anne Boleyn, and the rise of her rival Jane Seymour fascinated a wide 19th Century audience. With the opera Anna Bolena, Donizetti brought his art to a new height and created what many believe to be his masterpiece. Joan Sutherland brings all the experience of a remarkable career as a Donizetti singer to this recording which showcases the extraordinary longevity of her magnificent bel canto technique in one of her greatest stage roles. She is particularly impressive in the demanding final scene in which Anna prepares to face her execution - by beheading. A strong supporting cast is led by three outstanding American singers - bass-baritone Samuel Ramey as Henry VIII, tenor Jerry Hadley as Anna's beloved Lord Percy and Susanne Mentzer in the demanding mezzo-soprano role of Giovanna. Joan Sutherland's last complete bel canto opera recording is also one of her most triumphant.